Welcome to Becoming A Modern Man! 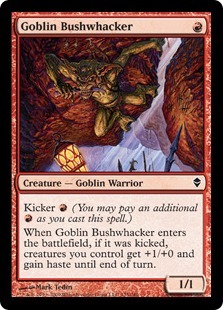 In this article I am taking a look at a new Goblins build which capitalizes on Reckless Bushwhacker. 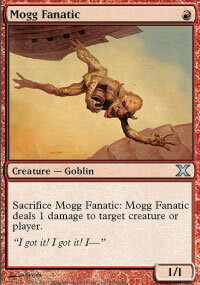 I covered Goblins in Modern some time ago, 2012 actually so a seriously long time ago, but since then there have been a few interesting additions. 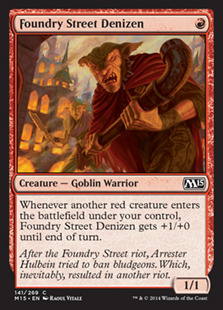 Foundry Street Denizen and Legion Loyalist are great additions to the one-drops available for the deck - making it far easier to run a cheaper and more aggressive deck. 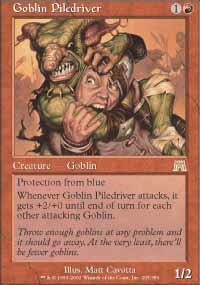 Goblin Piledriver was reprinted and introduced into Modern by Magic Origins - a traditionally powerful piece of Goblin decks. 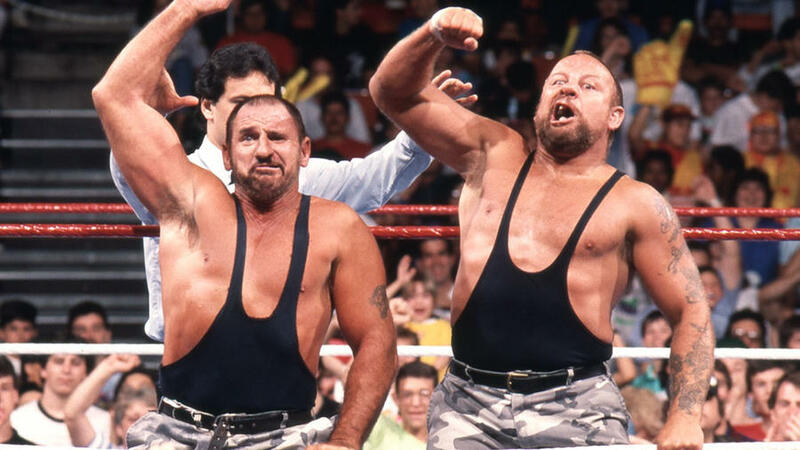 Now which one is Luke and which one is Butch is up for debate but they are a powerful little tag team. The Bushwhackers quickly turn a small group of 1/1s into a formidable attacking threat and these swarms of damage can quickly wrap up games. Also the fact that these pumps are granted as ETB effects means unlike Lords, such as Goblin Chieftain, you are not so vulnerable to removal. 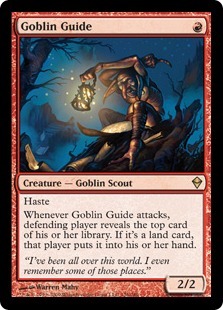 Guide is one of the most aggressive and cheap creatures available in the format. Fanatic is a great 1-drop in Modern. It can be popped as an answer to a number of threats in the format and in general is just another great 1-drop for the deck that wants to fill the board fast. An easily overlooked Goblin but one that packs a serious punch. Denizen picks up extra power every time you cast another Goblin which makes it very easy to make it a 2/1 or 3/1 early on. 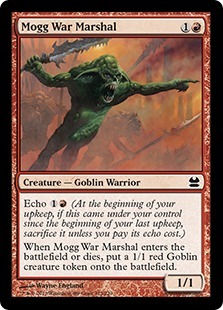 It also has a great interaction with Mogg War Marshal as the token coming into play gives it an extra pump, and if you are then able to sacrifice the Marshal with a Goblin Grenade then you have a 4/1 Denizen right there. 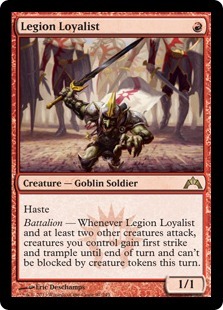 Legion Loyalist spent quite some time being overlooked but with the reprint of Goblin Piledriver it seems to be getting more attention. Loyalist is very good as it make attacks far more favourable, as first strike means you won't be trading with creatures of the same size and if you just used a Bushwhacker there is a chance you can trample some damage over too. Also, as I mentioned it is great with Goblin Piledriver as it far more likely that the Piledriver will survive combat and it can trample through additional damage. Mogg War Marshal is a Dragon Fodder on a body basically. It has the upside of being able to be sacrificed to Goblin Grenade for value and can help give you a little protection from sweepers. Obviously with a bunch of Bushwhacker effects in our deck we want as many creatures on board as possible. War Marshal helps build our board for a big attack. Goblin Piledriver loves attacking with friends and gets huge boosts in power when doing so. Our hasty creatures allow extra attackers drop in from hand for quick power boosts. Also as previously mentioned Piledriver loves Legion Loyalist as first strike and trample and abilities that benefit it greatly. Chieftain is the former 3-drop of choice for Goblins. The Lord has pros and cons when compared to Reckless Bushwhacker. It is much better in situations when your opponent doesn't have removal for it. Chieftain's pumps are permanent as long as he's around but if he is removed then your creatures reduce in size also - which can put you in a pretty bad situation. Bushwhacker on the other hand gives it's +1/+0 and haste bonus is granted when it is cast so removal isn't an effective way of handling it. 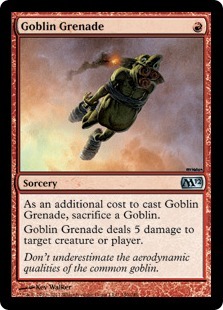 Goblin Grenade is a very powerful burn spell that we get access to thanks to being in the tribe. 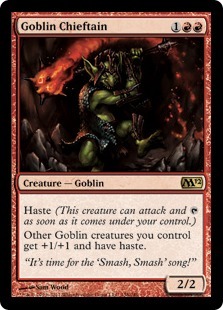 Obviously you can't afford to just throw all your Goblins away but it is a powerful option for finishing out a game or dealing with a large threat. 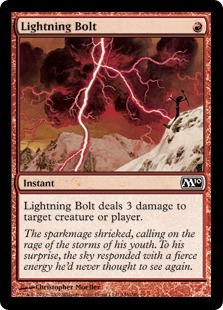 Lightning Bolt is a card that needs no introduction. One of the most shocking elements of the Top 8 of Pro Tour OGW is that it didn't contain a single Lightning Bolt. All mountains. The cheapest manabase possible for the deck. You could run Cavern of Souls here or even some creaturelands if you can find room. 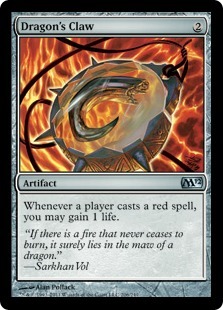 Dragon's Claw is a great help against Burn or really any other aggressive red deck you come across. The life gain pads out your life total nicely and allows to keep up the aggression. 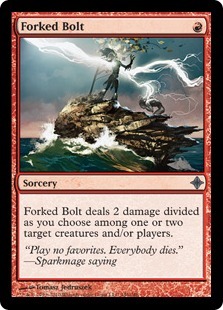 Forked Bolt helps deal with those pesky low toughness creatures that might get in your Goblins way or try blocking. 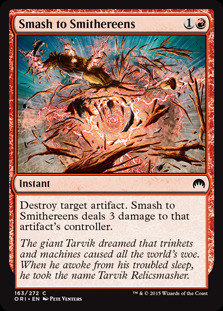 Smash to Smithereens is a great anti-artifact card that allows does a healthy 3 damage to the opponents dome to keep the pressure on. 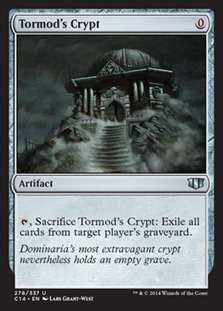 Tormod's Crypt is a cheap answer to the graveyard decks and its 0-cost means you can use it without giving up tempo. Chieftain, Piledriver and Fanatic supplement the copies in the main deck for matchups where they are particularly strong. Unfortunately I have had a bit of a nightmare recording videos with my aging laptop recently. I apologise if these videos are a bit laggy. The first matchup is a mirror match. This one is always going to be close. Both decks are racing to kill the other as fast as possible and it's difficult to defend effectively or profitably. Our next matchup is against Affinity. This match proved to be rough. Chalice of the Void for 1 reared its ugly head in Game 1 which is not a good card for us to run into - though in fairness main deck Chalice is quite unusual. Game 2 also proved rough as Ravager powered up their side of the board and then the combination of Inkmoth Nexus and Cranial Plating made short work of me. Our third matchup is against Burn. This is another tight aggro matchup, however, there is an advantage to having repeatable damage in the form of creatures. Dragon's Claw is an excellent card out of the sideboard for this match, though it can be a nightmare on the other end of the battlefield. I've seen a number of different decks that are trying out Reckless Bushwhacker. My personal thought process though took me back to the Kuldotha Red deck I looked at not too long back. The deck was about producing lots of little creatures quickly and then using Bushwhacker and Signal Pest to push through powerful attacks. Further Bushwhacker effects seemed perfect for that kind of strategy so that's what I looked at brewing up. This is a pretty rough draft but capable of some very explosive starts and like the original deck has some reach through Shrapnel Blast. I had some videos of this deck in action but as I mentioned I've had some serious troubles recording. Perhaps we will revisit this idea some other time. There is certainly some fun to be had with Reckless Bushwhacker in Modern. My opinion on Goblin decks in Modern hasn't really changed from back in 2012 when I first played the deck though. There have been quite a few nice additions since then but it still just feels rather underpowered in a format like Modern. That said it remains a solid budget option and a nice way to get into the format. 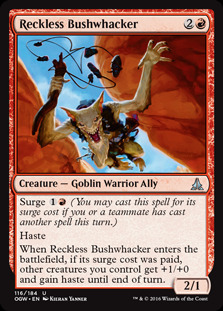 Reckless Bushwhacker is a card that is very powerful in aggro decks, however, it has the same problems I imagined it would when I first read it. Surge makes it a problematic top-deck in decks that just want to empty their hand. However, it is very powerful and I am seeing it pop up increasing in Zoo decks, Ally decks and various other places. I am using Bushwacker in a Zoo build. I will be writing/doing videos with it probably after all this Eldrazi nonsense but I do enjoy it thus far. Yeah it's pretty cool. I've seen some Zoo builds using the card. I like the synergy with Burning-Tree Emissary. I look forward to your article. I am hoping the format will open up with the Eldrazi ban.